The place of the crash. Image from Google Streetview. Someone lost a daughter last week. Olga Rodriguez was killed by a driver while crossing the street in downtown San Rafael. Though her unnamed walking companion survived, he’s in the hospital with serious injuries. The driver, who stayed on the scene and is cooperating fully with police, only stopped after he heard them being hit. According to him, he never saw them. The driver was turning left from Third Street to Heatherton. From photos, it appears that he was in the inner left-turn lane where it would be harder to see anyone in the crosswalk. The truck is also quite tall, so it’s entirely possible he never did see either Olga or her companion. That’s a sign the intersection is broken, and the crash was likely preventable. We cannot erase the physical scars of Olga’s companion. We cannot bring back Olga or wash her blood from the conscience of the driver who killed her. But we can honor the companion’s wounds and Olga’s death and make sure this never happens again. The whole block around the transit center needs major renovations. There is no safe way to access the transit center. It’s all configured for the freeway entrance. count downs and zebra stripping are good low cost quick fixes But San Rafael needs to do much more than that for the long term when the train comes to town. I agree 100% with the need for a leading pedestrian signal interval at that corner. I often drive that and nearly miss seeing pedestrians stepping out there under the shadow of the freeway. It is SO NECESSARY there to install an LPI. And is usually just a tweak in the computer in the Public Works office. 1. Do not put crosswalks where they result in high danger crossings. 2. Somehow educate pedestrians to understand the concept of “dead right”. What we’re doing in situations as discussed here is tricking pedestrians into high risk behavior.There was a very similar story in San Jose recently, pedestrian in crosswalk dies when car makes left turn. Sure, it’s the driver’s fault, but it’s the pedestrian who suffers the real consequences. Near as I can tell, crosswalks unprotected by signal lights are almost always a bad idea. We’re better off with pedestrians expecting no protection at all than becoming trusting of a painted line. Blaming the victim. Classy, dw. dw, your solution to the problem appears to be very automobile-centric. Rather than relatively quickly and cheaply modifying the traffic signals at this specific intersection, you seem to propose the elimination of this crosswalk. This would be an inconvenience and a disservice to the many pedestrians that utilize the existing crosswalk. 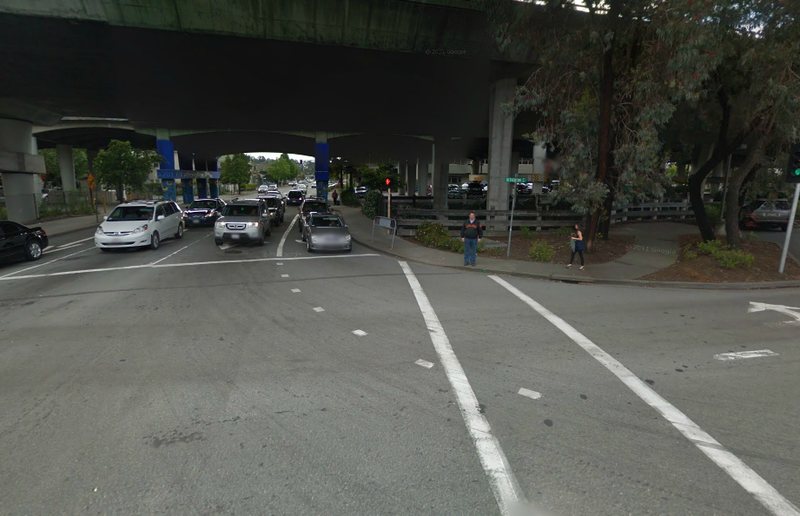 Numerous San Francisco intersections now have LPI and, as the author points out, for the sake of safety it should be added to 3rd and Heatherton, too.